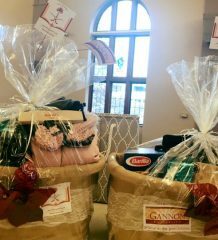 Gannon University’s annual Day of Caring is scheduled for Saturday and students are getting ready to celebrate the day with community service projects across Erie. Participants should report at 8 a.m. Saturday to the Hammermill Center in Waldron Campus Center. There will be free doughnuts before the opening ceremony begins. 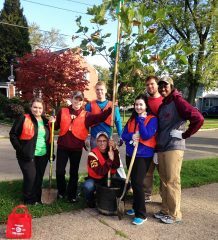 From there, dozens of Gannon students will meet before breaking into their various clubs and organizations to begin volunteering in the Erie community. Among these clubs and organizations will be Gannon’s ROTC. This will be their first year participating in Day of Caring, said Megan Lang, a junior biology pre-med major and member of ROTC. It is the first year that ROTC has been recognized as a club on campus and been able to volunteer together. Lang said that ROTC members plan to clean up at the Lake Erie Arboretum at Frontier Park. She said they are looking forward to it. “We’re excited to help the community,” Lang said. Before this year and before participating with ROTC, Lang also did Day of Caring her first two years at Gannon through her involvement with Phi Sigma Sigma. It’s a tradition for her as much as it is on Gannon’s campus. Day of Caring has been an event on campus for at least 10 years starting earlier than 2009, said Sara Nesbitt, the program coordinator for the Center for Social Concerns. Since last year, not a lot has changed. Shirts, though, have returned, Nesbitt said. Last year, Day of Caring shirts were not given out like they had been the years before. This year, the shirts will be back and given to participants. Last year, there was also around 350 students who got involved in the event, she said. The goal for this year is to have around 400 students participate, but it is likely to fall short by a few people. What is increasing, though, is the work done with Our West Bayfront organization, Nesbitt said. It is a project close at heart to Gannon as the university is one of the founding partners of the organization. “Being active in our immediate community is pretty important to us,” she said about Our West Bayfront. 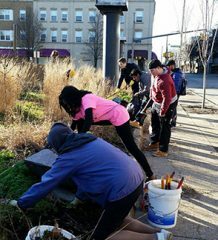 More clubs participating in Day of Caring are also working on coming up with their own projects for the day, Nesbitt said. The fishing club is partnering with a local fishing organization and is working to clean a river. Pi Kappa Alpha is working with its neighborhood watch on Saturday. “We just love when organizations have these relationships,” Nesbitt said, naming this the coolest part about the event. Delta Kappa Epsilon has also made its own project through its relationship with Friends of the Library. For Day of Caring, the organization is holding a book drive where the men go to the Bayfront and help unload old books and magazines. They did this last year as well, said Sidney Oyatta, a junior computer information systems major and a member of the organization. “It was very cold, but we took pride in helping out and had fun while doing it too,” Oyatta said. They are also excited about this year’s event and can’t wait to help out, he said.